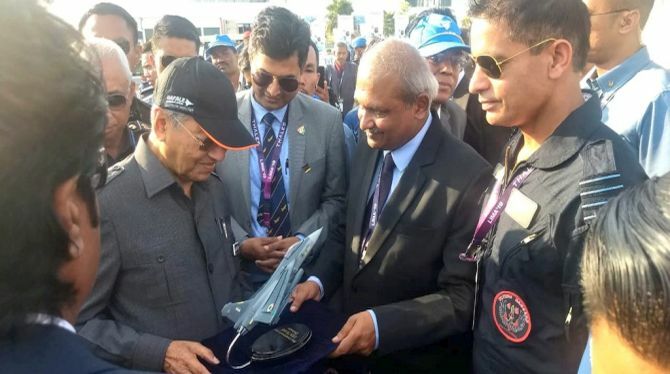 Langkawi: The Malaysian Prime Minister Mahathir Mohamad interacted with the Indian Air Force (IAF) and Hindustan Aeronautics Limited (HAL) teams here at the ongoing 15th edition of the Langkawi International Maritime and Aerospace Exhibition (LIMA '19). He also sat in a Tejas fighter jet at the exhibition. The world's lightest supersonic fighter is taking part in aerial displays for the first time at LIMA '19. The Light Combat Aircraft (LCA), Tejas, is a supersonic, single-seat, single-engine multi-role light fighter jet that has been under development since 1983 by state-owned HAL. The biennial show LIMA commenced from March 26 in Malaysia this year. The event brings together exhibitors, suppliers and government officials together to "engage and expand their networks towards forging new partnerships and business agreements."